Find trails and tips on how to enjoy ATVing in the Summit County. Looking for a little adventure during your next summer trip to Summit County? Why not check out the hundreds of miles of trails open to ATV's and off road vehicles. With thousands of acres of public land, Summit County is a playground for adventure. Whether your looking for a guided tour or just want to get out solo to play in the dirt, Summit County has something for everyone. 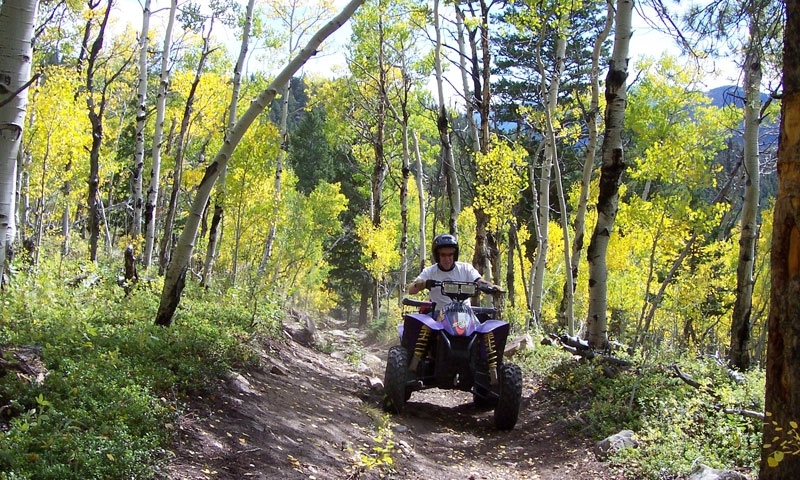 There are many different options in Summit County for ATV and off road vehicle rental as well as guided tours. If you want to rent an ATV and head out solo there are rental options in most towns in Summit County. Most rental places will provide helmets and the first tank of gas plus a map of the area. Know that often times reservations aren't weather dependent, they'll expect you to show up rain or shine. ATV season typically runs June through October but is dependent on when the Forest Service opens the trails. If you are looking for a tour, those are also available. You'll be guided by an expert who is familiar with the trails, conditions and hazards. Whether your renting or going on a tour, make sure to dress appropriately-long pants, boots, gloves and a jacket as the bare minimum- and make sure to check around for the company that best suits your needs. Costs vary depending on the type of machine you rent and their may be regulations and restrictions for children. The White River National Forest is the most popular spot to ATV in Summit County. This forest includes 2.3 million acres and offers an abundance of trails for ATV and other off road vehicles. Before heading out on your own you should be aware of forest service regulations. Many trails are multi-use trails, meaning horses, hikers and bikers may access the same trails you do on your ATV or off road vehicle. Make sure to follow protocol for making other users aware of your presence and to keep everyone on the trail safe. I've listed a few of the more popular trails in the White River National Forest. Make sure to check local maps for directions and other regulations. It's important you access trails that are meant specifically for ATV and off road vehicles as the forest service will give you a hefty fine for riding in a wilderness area or other off limits spots. This trail is open to OHV, Hiking and Mountain Biking. It's 6.5 miles long and rated as an easy trail. This trail is available to OHV, hiking and mountain biking and offers incredible views of the Continental Divide. The trail is 3.3 miles long but can be made into a loop for a longer ride. This 4.1 mile trail is open to OHV, mountain biking and hiking. Ruins of an old mining camp can be found at 3.3 miles which makes a nice lunch spot. Although this is technically located in the Arapapho National Forest, it's still in Summit County. There are a few different trails located around the reservoir. Check maps for exact location and ability level recommendations. Whether you’re new to the ATV world or an old pro, Summit County offers everyone an opportunity to enjoy this exhilarating activity. With millions of acres of public lands you're sure to find a trail, tour or rental that meets your group’s needs. For the most up to date information and safety regulations, please contact the National Forest Service before riding on any trails.